Today was the media preview of the World Post Day – Pos Silang stamp issue. Setenant stamps of 50 sen each – 125,000 pieces per stamp design (there are 4 designs). The 4 stamp designs are: Write – Send – Receive – Repeat respectively written in micro text that joins to form the blue circle around the globe. Postcards of RM 1.00 each – 6,000 postcards per design (there are 4 designs). The designs are (a) Traditional Musical Instrument, (b) Iconic Buildings, (c) Traditional Kite (Wau Bulan) and (d) Postbox Shape. Empty folder of RM 6.00 each – 1,800 pieces. Empty envelopes – 32,000 pieces. 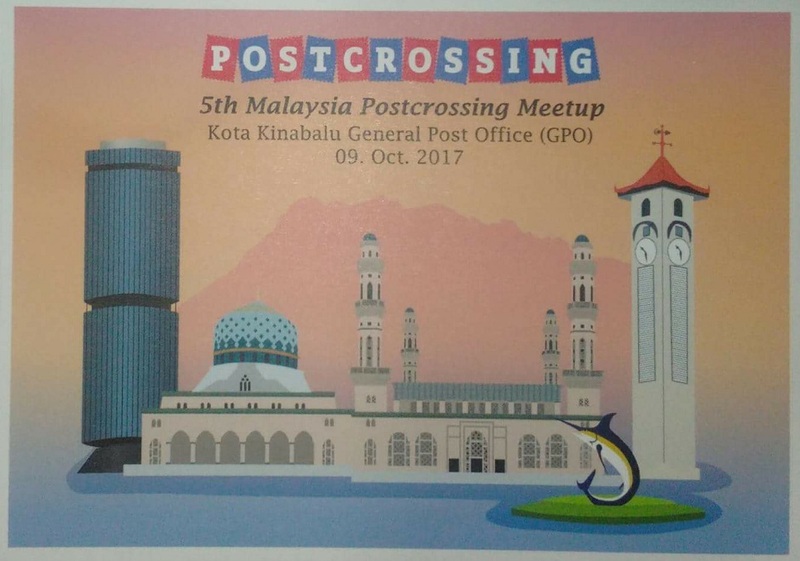 In addition, there is a 5th Postcrossing Meetup plus Postcard Exhibition at Dewan Sri Pos, Level 3, General Post Office, Kuala Lumpur (starting at about 09:45 am) and also in Kota Kinabalu. 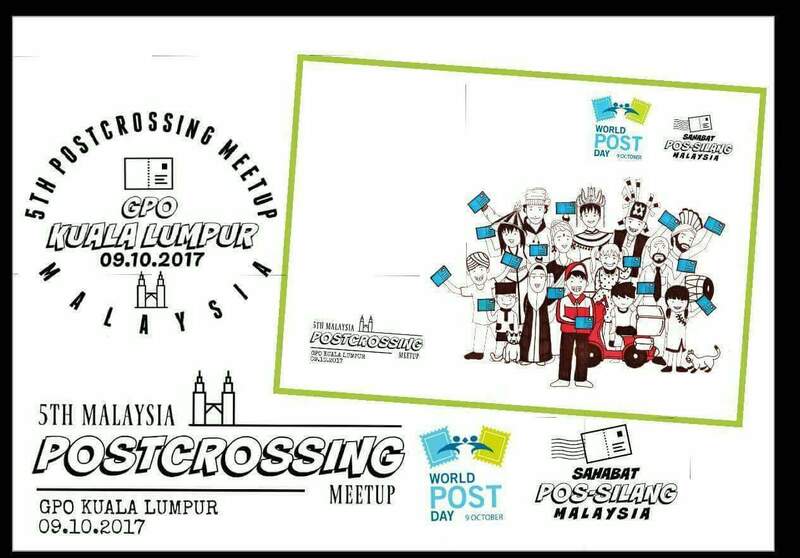 The 5th Malaysia Kuala Lumpur Postcrossing Meetup Postcard image is courtesy of Honey Sha. There will be another postcard for the Kota Kinabalu meetup with a similar oval cachet (only 1 cachet). The meetup is planned at Sea Monster Restaurant, Segama (Lot 8, Block D, Jalan Labuk, Segama Komplex, Kota Kinabalu) at around 12:30 pm to 03:00 pm. The 5th Malaysia Kota Kinabalu Postcrossing Meetup Postcard image is courtesy of Cikgu Charlie Dale. The Kota Kinabalu cachet will have some modifications from the image shown above. For more information, head on to: https://www.postcrossing.com/ , locate the Forum and look for Malaysia. 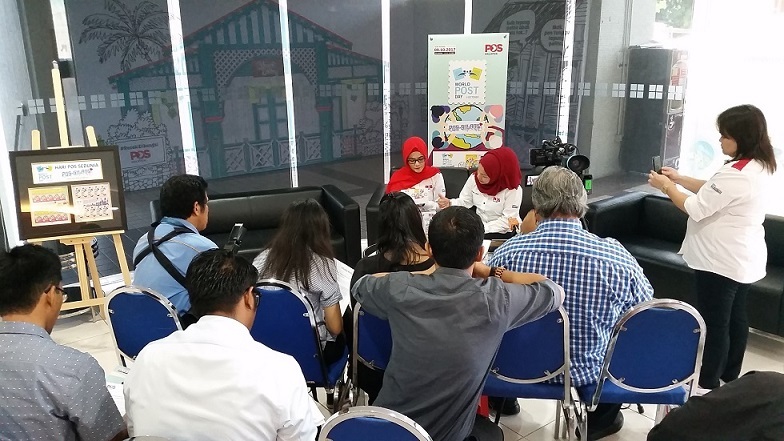 The Malaysian Communications and Multimedia Commission (MCMC) will also be hosting an event at MCMC Tower 1 lobby from 09:00 am to 05:00 pm. It is expected to run from 09 – 12 October 2017.